The Children’s Museum of Indianapolis Intermodal Phase 2 was completed in the summer of 2009. This award winning project was designed with 3 key principles in mind...education, environment, and FUN! All aspects of the site design involved educational opportunities for museum visitors of all ages. 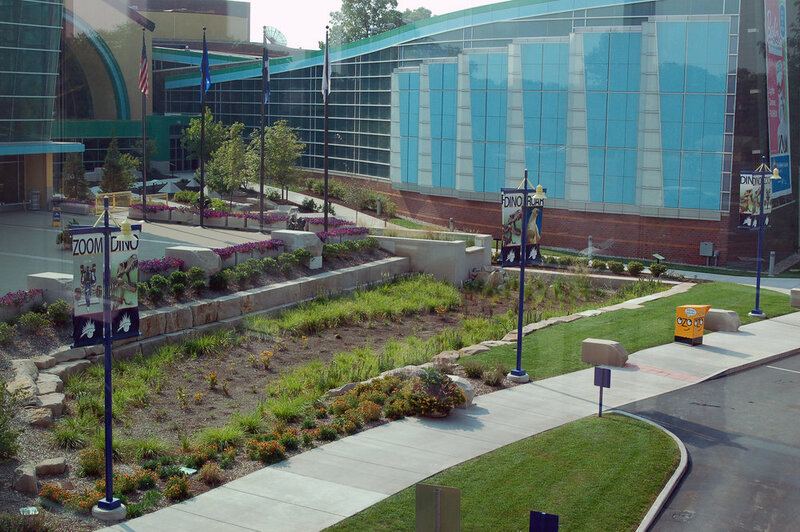 From the environmental aspects and native plantings of the extensive raingarden to the historical features found in the Seven Wonders of the World sculptures and the prehistoric dinosaurs climbing through the roof of the building, the site provides a wide variety of fun and interactive opportunities to learn about the environment, history, and culture. Jeff and Michelle served as the landscape architects, leading the site design efforts, for this exciting project while working at Synthesis, as part of Ratio Architects project team.